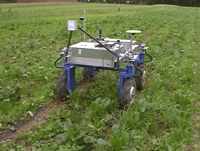 Driving in a beet field with a Cropscan sensor on the front. 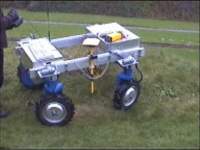 RTK/GPS basestation and a test where the robot follows the waypoints seen on the figures on page: RTK/GPS tests. With 4-WD and 4-WS the vehicle is very flexible. 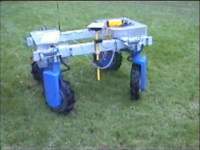 The robot can drive up to 1.6 m/s with RTK/GPS, but are marginally stable. The controllers are not tuned yet. Overshoot can be seen. Out to get a feeling of the performance in the field. 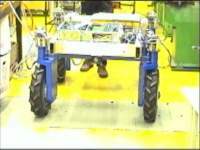 The motor controller needs to be tuned. 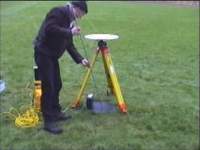 On firm ground vibrations of the GPS antenna can be seen. Testing the climbing performance 2 drive motor fuses blew, because we only had 10 A per motor. The recommended fuses are 30 A. 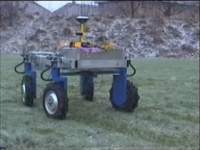 The compass is calibrated by driving the vehicle slowly in a circle with changing roll and tilt. 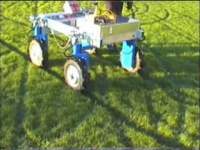 To get high precision it is necessary with a reference on the ground.